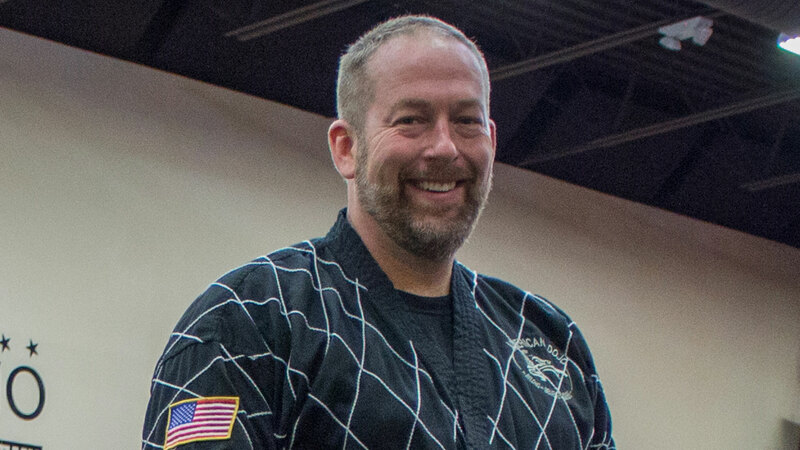 Master Dean Konley was born in Milwaukee and raised in Waukesha. A very active young boy with a bright personality, he struggled with a learning disability now recognized as dyslexia. Sadly, this caused much discouragement, as he was troubled by the teasing of his schoolmates, and teachers who didn’t understand why he was unable to read. By the time he reached early adolescence, Dean had resorted to disrespectful and destructive behavior in order to gain the attention and acceptance of his peers. However, a turning point came for him when at the age of 14, Dean joined a Tae Kwon Do academy in Waukesha. It was there that he found discipline and truly positive mentors, a place to BELONG. For the first time in his life, he experienced having mentors who BELIEVED in him, and he felt that he could ACHIEVE his goals. While in high school, Dean went on to compete in many tournaments at the state and national level in Tae Kwon Do, and held the state championship title in sparring (heavyweight division) for 6 straight years. In 1985, he earned the bronze medal in sparring at the USTU National Tae Kwon Do Championships. While this was a tremendous accomplishment, his martial arts training benefited him outside the Dojo as well. He learned to cope with his dyslexia, and was able to excel academically in high school, graduating in 1989. Dean earned his 1st dan black belt in 1986. Since then, has continued his martial arts training in earnest, studying & earning rank under world – renowned martial arts masters. In 1999 he was introduced to Grandmaster In Sun Seo, whose knowledge and skill in Korean martial arts he has found to be virtually unsurpassed. Master Konley has earned his 4th, 5th and 6th, & 7th dan black belts under the instruction of Grandmaster In Sun Seo. In 1996 he married Virginia, and together the couple has worked to build the academy curriculum, culture, instructor team, and strong student base that they enjoy today. Master Konley is the proud father of 3 sons and a 2 daughters: Zachary (’98), Gabrielle (’01), Titus (’06), Levi (’09), and Haven (’15). My purpose is to discover and unlock my true potential in life…. and through martial arts training, to inspire those around me to do the same!